It is important to introduce researchers, curriculum developers, administrators, classroom teachers, and other groups who focus on gifted and talented populations to the Social Psychology of Creativity. Unusually high levels of intelligence or other hallmarks of giftedness do not necessarily predict creative behavior (Stein, 1968; Wallach, 1971). Yet many gifted children do have the requisite “ingredients” to become highly creative adult contributors to the arts and sciences. If these gifted students are to realize their creative potential, particular attention must be paid to the promotion and maintenance of their intrinsic motivation in the classroom. The empirical study of creativity has long been dominated by an emphasis on the individual difference variables that contribute to high levels of creative performance. Implicit in much of this work has been a focus on the internal determinants of creativity, to the exclusion of external factors such as the environmental circumstances conducive to creativity. Researchers interested in the psychology of creativity have typically chosen to decontextualize the creative process. Yet creativity does not come about in a vacuum. A large number of investigations carried out by social psychologists over the past two and one half decades have now established that there is a direct link between the motivational orientation brought by an individual to a task and the likelihood of creativity of performance on that task. And we now understand that the environment plays a large part in determining that motivational orientation. As described by Renzulli (1986), the standard approach to the study of gifted persons has also generally reflected the notion that giftedness is a condition somehow magically bestowed. Recently, however, some researchers have advanced the argument that it makes more sense to shift the emphasis from being gifted to the question of how to develop gifted behaviors in children in the classroom (e.g., Feldhusen, 1995; Houtz, 2003; Renzulli 1986, 1999a, 2002; Sternberg, 1998, 2000; Torrance & Sisk, 1997; Treffinger, 1988; Treffinger, Isaksen, & Dorval, 1996; Treffinger, Young, Nassab, & Wittig, 2003). Social psychologists working to specify the environmental conditions most conducive to creativity have much in common with investigators whose goal it is to help foster gifted behaviors in children. The two fields have much to offer one another and it is high time that a systematic exchange of theories, models, research findings, and practical applications take place. Historically, definitions and assessments of giftedness have been directly linked to tests of intelligence, most especially the IQ score (Renzulli, 1986). But are giftedness and intelligence as closely related as many of the experts would have us believe? There is growing concern that the prevailing conceptions of giftedness (and, as a result, our measurement techniques) are far too narrow. Renzulli (1986), for example, proposes that, at the very least, we must recognize two distinct categories of giftedness: schoolhouse giftedness and creative-productive giftedness (Renzulli, Smith, & Reis, 1982). Both types, he argues, are important and the two categories often interact. But it is not unusual for children (and persons of all ages) to demonstrate an “unevenness” in their giftedness profile—with their strengths in one of the two areas far outweighing their abilities in the other. What Renzulli terms “schoolhouse giftedness” might also be thought of as test-taking or lesson-learning giftedness. This form of giftedness is fairly well served by standard IQ and other indices of cognitive ability. And because schoolhouse giftedness is relatively easy to recognize and test, it is high scores in this realm that is most often lead to students being identified as gifted and invited to participate in special programs. The hallmarks of what Renzulli terms creative-productive giftedness are often more difficult to recognize in students. Creative-productive giftedness results in the production of original material and tangible products that are intended to be shared with and to impact others (Renzulli, 2002). Research shows that this second type of giftedness is not all that closely tied to intelligence and traditional tests of IQ. While it is true that persons with relatively low levels of intelligence exhibit almost uniformly low levels of creativity, there is great variability in the creativity of individuals earning average to well-above-average intelligence scores. Simply stated, the IQ-creativity correlation is quite low (Stein, 1968; Wallach, 1971) and creative-productive giftedness is far too complex, far too multi-faceted, to be captured by a numerical score on a test of intelligence, aptitude, or achievement. This recognition that creative-productive giftedness cannot always be quantified with a test score calls for a shift of emphasis among educators toward an exploration of “potential giftedness” and the concomitant question of how such potential might best be fostered. In psychological terms, the focus of attention must move away from an emphasis on giftedness as a stable trait toward an understanding that creative-productive giftedness may, in many respects, be better conceptualized as a situation-specific state. Creative-productive giftedness can be nurtured if conditions are right for an appropriate interaction to take place between the gifted student and the environment (Renzulli, 1986). But what are the conditions under which giftedness is most likely to blossom? 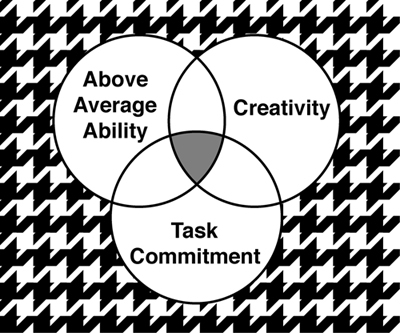 Above average, although not necessarily superior, ability; task commitment, and creativity. Importantly, no one component of this three-part model can, on its own, make for high levels of accomplishment. Rather, it is the interaction between the three clusters that leads to creative-productive giftedness. Somewhat similar componential models have also been suggested by Csikszentmihalyi (1996), Guilford (1967), Treffinger (1992), Sternberg (1985) and others. In the process of developing this model, Renzulli and colleagues conducted a large number of research studies that focused on various aspects of this three-part conceptualization and these findings have been summarized in a variety of venues (see (Renzulli, 1998, Renzulli & Reis, 1994). Work done by Winner (2000) and Gallagher (1990) reveals the intense drive and unusually high levels of intrinsic motivation often demonstrated by gifted children and there are a number of important parallels between Renzulli’s theory and the biographical and autobiographical accounts of the lives and creative breakthroughs of eminent individuals representing a variety of fields (e.g., Bloom, 1985; Csikszentmihalyi, 1997; Gardner, 1993; Gruber, 1981; Renzulli, 2002). Across history, high levels of intelligence or especially developed skills in one or more areas have often not, in and of themselves, been sufficient for product-based creativity to flourish (Winner, 2000). The capacity for creative thinking coupled with a single-minded determination to persevere until a solution is reached are also necessary ingredients (Amabile, 1996). Renzulli presents compelling evidence to support this three-part model, yet absent from his writing is any mention of the empirical research spearheaded by social psychologist Teresa Amabile. While other researchers and theorists interested in gifted populations (e.g., Treffinger, Isaksen, and Feldhusen) have occasionally referenced studies carried out by Amabile and colleagues, very few attempts have been made to directly integrate this work that comes from the mainstream social psychological literature with research that specifically targets gifted students. By the same token, Amabile and her collaborators, myself included, have for 25 years or more been publishing findings that speak directly to models of creative production among gifted children, yet they too have failed to make the connection. It would appear that these two longstanding programs of research have evolved completely separately of one another. A melding of the two perspectives is long overdue. While it is certainly possible to teach (and learn) domain skills and perhaps even creativity skills, motivational orientation is much more ephemeral. Motivational state is highly variable and largely situation-dependent. It is on this question of how the environment helps to shape motivational orientation that Amabile and colleagues have focused their attention. In this research and theorizing, the distinction is made between two types of motivation. Intrinsic motivation is the motivation to do something for its own sake, for the sheer pleasure and enjoyment of the task itself. Extrinsic motivation, on the other hand, is the motivation to do something for some external goal. Intrinsic motivation is conducive to creativity, and extrinsic motivation is usually detrimental. In a basic research paradigm designed to test this proposition, study participants are randomly assigned to either constraint or no-constraint conditions. For instance, individuals are either led to expect a reward for their participation or no reward is mentioned, and then they are asked to produce some sort of observable product that can be assessed for level of creativity. Their motivational orientation (i.e., whether intrinsic or extrinsic) is also measured. Whether the targets of an investigation are preschoolers, fifth graders, or college students, the findings are consistent. Over the years, five environmental constraints have consistently proven to be sure-fire killers of intrinsic motivation and creativity (Amabile, 1983a, 1996; Hennessey, 1996): (a) Expected Reward (b) Expected Evaluation (c) Competition (d) Surveillance and (e) Time Limits. Might this list of killers be just as well be labeled as a recipe for the typical American classroom? As unbelievable as it may seem, we have somehow managed to structure educational environments in such a way that intrinsic motivation and creativity are bound to suffer, if not be completely destroyed. The all-important question that must be addressed is how this situation can be turned around. How can teachers and administrators be helped to nurture the intrinsic motivation of their students? How can children be helped to develop an excitement about learning and the playfulness and the willingness to take risks that many researchers believe are crucial to creativity (e.g., Amabile, 1983a, 1996; Dansky & Silverman, 1975)? The key element seems to be the preservation of a sense of self-determination. Rewards, evaluations, or other extrinsic constraints that are perceived as informational, useful and informative as to the quality of one’s performance rather than as controlling instruments of coercion can serve to increase task involvement and should not be expected to have detrimental effects. The expectation that one’s performance will be evaluated or rewarded will only be detrimental if the interpersonal atmosphere of the setting causes the individual to feel intimidated or self-conscious. In situations where the individual feels in control of her own destiny, motivation and creativity need not suffer (Deci & Ryan, 1985). When children experience the interpersonal context of the classroom as supporting of self-determination, they will be more intrinsically motivated (Deci, Nezlek, & Sheinman, 1981). Dozens of investigations conducted in both heterogeneous and gifted classrooms (e.g., Esquivel, 1995; Torrance, 1962) have revealed strong, positive correlations between teachers’ orientations and their students’ motivational outcomes. Moreover, teachers’ orientations have been found to impact children’s motivation within the first 6 to 8 weeks of the school and this influence remains strong throughout the year. Thus, it is the functional significance of one’s environment (i.e., the individual’s perception of the reward or evaluation as well as perceptions of the motivations of the teacher imposing these contingencies), rather than its objective properties, which affects motivational processes (see also deCharms, 1976; Ryan & Grolnick, 1986). Based on these studies and others like them, it appears that gifted and talented students who consistently approach their class work with high levels of skill may be especially impacted by the negative effects of extrinsic constraints that threaten perceptions of self-determination. Gifted children are often well aware of their unusual talents. Drawing on past experience, they can be relatively sure that they will outperform their more typically developing peers; and, as a result, they tend not to be especially dependent on the informational feedback that sometimes accompanies reward or evaluation contingencies. What many gifted students do need, however, is assistance in maintaining their intrinsic motivation. Despite the fact that some widely accepted hallmarks of giftedness include the tendency to be highly motivated, have a long attention span and become entirely immersed in a problem (Winner, 1996a, 1997), research shows that gifted children often struggle with motivation in the classroom (Reis & McCoach, 2000). These motivational difficulties may stem from the fact that gifted students tend to be self-motivated, rather than teacher-motivated. They typically perform better with unstructured, flexible assignments and they prefer to select their own learning experiences, rather than being given a set task (Winner, 1996a, 1997). Rather than being bolstered by their unusual abilities and talents, many gifted children appear to be particularly vulnerable to classroom environmental influences. Too often their enthusiasm and motivation are stifled by teachers invested in seeing that they conform to accepted practices, and they become easily bored. They often do not know how to set appropriate goals or to deal effectively with interpersonal situations or adults’ high expectations. Taken together, these difficulties often result in underachievement in school, one of the most common problems faced by the gifted student population (Webb, Meckstroth, & Tolan, 1989; Winner, 1996b). Given their obvious talents and intellectual superiority early in life, surprisingly few gifted children grow up to be creative adults (Winner, 1996a). At issue here is the fact that while much of the research and theorizing that has been done on creativity and the gifted has concentrated on the role played by these children’s academic superiority in the creative process, a high level of intelligence is but one of the necessary ingredients for creative performance. Researchers have tended to investigate only the largely innate, or at least largely immutable, differences between creative and uncreative or gifted and less academically talented students. The Creative Intersection Model presented here (Amabile, 1997), on the other hand, focuses on “creative situations”—the particular social and environmental conditions that can positively or negatively impact the creativity of most any individual. How might the gifted child be characterized according to the intersection model? Hunsaker and Callahan (1995) report that the majority of schools have adopted definitions of and criteria for giftedness that include creativity; and it might seem reasonable to expect that where creative behavior is concerned, gifted children can be expected to fare particularly well. Yet the overwhelming majority of students identified as gifted have earned that designation because of above average general ability and knowledge (what Amabile terms domain-relevant skills) (Renzulli, 1986). Importantly, over 25 years of empirical research tell us that no amount of domain-relevant (or even creativity-relevant skills) can compensate for a lack of intrinsic motivation to perform an activity. Task motivation makes the difference between what an individual can and will do (Amabile, 1983b). It is task motivation that determines whether domain skills and creativity skills will be adequately and efficiently tapped in the service of creative performance. While some research has revealed that intellectually gifted children can display strong levels of intrinsic motivation (Gallagher, 1990; Winner, 2000), educators must be careful not to take this tendency for granted. As reported earlier, studies show that gifted children often struggle with motivation in the classroom (Reis & McCoach, 2000). Teachers of the gifted must remember that their students’ advanced intellectual capacities and problem solving skills will often not be enough to ensure that creativity will flourish within the classroom. It is essential to also consider students’ motivation and to conceptualize their motivational orientation as both a relatively enduring trait and as a temporary situation-specific state. Intrinsic motivation is a most delicate and often fleeting entity. Even especially gifted students, who may be generally more highly intrinsically motivated toward what they do, can quickly fall prey to outside influences. Intrinsic motivation cannot be taught. It cannot be coerced, but it is easily squelched. Intrinsic interest must come from within the individual and some classroom environments are much more conducive to this happening than are others. Prominent researchers and theorists have spent the better part of their careers gathering evidence that refutes what has been termed the “instant-eminence model of giftedness.” The argument they set forth is that giftedness in children is not an already developed capacity as many educators and psychologists would lead us to believe. Rather, it is a capacity that needs nurturance and environmental support to blossom. The essential problem is this: If the motivation of many privileged students whose gifts have long been recognized and nurtured by families and schools can fall prey to the undermining effects of environmental influences, what about the motivational orientation of gifted students who might have the potential to make creative-productive contributions but who have not enjoyed the benefits of specially funded enrichment programs or high expectations from parents and teachers? Educators must be sensitized to these issues. They must question whether a gifted child who comes from an economically disadvantaged and/or minority background can be expected to attempt a creative solution to a problem or to maintain an interest in learning. Gifted students belonging to more marginalized groups are particularly in need of help if they are to find their own creative intersection. A close examination of investigations into the psychology of creativity reveals that very little empirical work has been specifically targeted at either non-Western cultures or persons of color or other racial-minority or linguistic-minority groups within the U.S. and Europe. While Torrance (1978) and Renzulli (1973) have long argued for the consideration of LCD (Linguistically and Culturally Diverse) populations in the gifted and talented literature, it is only in recent years that a small but growing number of gifted and talented experts have systematically advocated for a consideration of all children: Rich and poor, native English speakers and bilinguals, Blacks, Hispanics, Asians, and Whites. For example, Renzulli questions whether it makes sense to take a program that has proven successful in an affluent suburb and impose it on an inner-city or rural school district (Renzulli & Reis, 1994). As an alternative, Renzulli has developed an all-inclusive School Enrichment Model (SEM) (Renzulli & Reis, 1994, 1997, 2002) that he believes can be readily adapted to any student population or school situation. SEM moves away from a strict adherence to an arbitrary “cut off” score or other entrance requirement and makes it possible to include a variety of students who might otherwise never have been considered gifted (or potentially gifted). As Renzulli explains, programs that rely on traditional identification procedures may not be serving the wrong students, but they are certainly excluding substantial numbers of especially able but underachieving pupils—students who, if given the right classroom circumstances, could also demonstrate stellar achievements and signs of giftedness (Renzulli, 1999b). In their present form, the majority of American classrooms, from preschools through high schools and colleges, are fraught with killers of intrinsic interest and creativity. Nowhere is this situation more dire than in the gifted and talented classroom or “pull-out” program where the promotion of students’ intrinsic motivation and creativity of performance must be top priority. Modifications of curriculum or materials, modules aimed at creativity enhancement or lessons in techniques for brainstorming or “thinking outside the box” are not enough. Administrators, teachers, parents, and students must work together to change both individual classroom environments and the overall climate of their educational institutions. If gifted students are to be helped to find their creative intersection, significant and fundamental changes must be made to the way that educators think about teaching and learning. Towards this end, a few researchers in the area of gifted and talented education have, in recent years, turned their attention to programs that can be individualized to meet a particular child’s interests and needs. Rather than singling out only a few students who might demonstrate exceptional ability in one or more narrowly-defined, traditional subject areas, this alternative approach recognizes student strengths and talents along a wide variety of dimensions. Treffinger’s (1986) individualized model or Feldhusen’s (1992, 1995) program for talent identification and development are two primary examples of programs that strive to help students to reach higher levels of accomplishment and productivity, at their own pace and in their own way. The suggested actions outlined below are based on 30 years of empirical data gathered by social psychologists interested in promoting intrinsic motivation and creativity in the classroom (for extensive reviews of the literature, see Hennessey, 2003; Hennessey & Amabile, 1988). While many of the earlier investigations in this genre tended to target White, middle-class, suburban school students, there is a growing body of evidence to indicate that all children, both gifted and more typically developing, can benefit from these changes. And, in fact, the intrinsic motivation and creativity of economically disadvantaged children and culturally different students have been shown to be particularly vulnerable to classroom environmental factors (Lopez, 2003; Lopez, Esquivel, & Houtz, 1993 ). None of these suggested reforms necessitate large budgets or a major reallocation of funds. Instead, what are needed are a deep commitment to change and a willingness on the part of the entire educational community to band together to make the school environment conducive to the development of intrinsic motivation and creativity. Teachers must work diligently to create an interpersonal atmosphere that allows students to feel in control of their learning process. Teachers and administrators must step back and critically review the incentive systems that are currently in place. In situations where extrinsic incentives are being used, students must be helped to distance themselves from those constraints as much as possible. Students must be helped to become more proficient at recognizing their own strengths and weaknesses. Clearly, these fundamental changes in attitude and behavior will not happen over night. But our experience as researchers tells us that teachers, parents, and students are hungry for the opportunity to view education in this new light. Our message that students’ own intrinsic interest, curiosity, and excitement about learning must not take a back seat to concerns about grades or the need to outperform one’s peers resonates with educators. And if given the license to effect these changes, we believe that schools can, in fact, make great strides towards fostering the intrinsic motivation and creativity of their gifted students as well as the general population. Amabile, T. M. (1983a). The social psychology of creativity. New York, NY: Springer-Verlag. Amabile, T. M. (1983b). Social psychology of creativity: A componential conceptualization. Journal of Personality and Social Psychology, 45, 357-377. Bloom, B. (1985). Developing talent in young people. New York, NY: Ballantine. Csikszentmihalyi, M. (1997). Creativity: Flow and the psychology of discovery and invention. New York, NY: HarperCollins. Dansky, J., & Silverman, I. (1975). Play: A general facilitator of fluency. Developmental Psychology, 11, 104.
deCharms, R. (1976). Enhancing motivation: Change in the classroom. Oxford, England: Irvington. Deci, E. L., Nezlek, J., & Sheinman, L. (1981). Characteristics of the rewarder and intrinsic motivation of the rewardee. Journal of Personality and Social Psychology, 40, 1-10. Esquivel, G. B. (1995). Teacher behaviors that foster creativity. Educational Psychology Review, 7, 185-202. Feldhusen, J. F. (1992). TIDE: Talent identification and development in education. Sarasota, FL: Center for Creative Learning. Feldhusen, J. F. (1995). Talent identification and development in education (TIDE) (2nd ed.). Sarasota, FL: Center for Creative Learning. Gallagher, A. (1990). Personality patterns of the gifted. Understanding Our Gifted, 3, 11-13. Gardner, H. (1993). Creating minds: An anatomy of creativity seen through the lives of Freud, Einstein, Picasso, Stravinsky, Eliot, Graham, and Gandhi. New York, NY: Basic Books. Gruber, H. E. (1981). Darwin on man: A psychological study of scientific creativity (2nd ed.). Chicago, IL: University of Chicago Press. Hennessey, B. A. (1996). Teaching for creative development: A social-psychological approach. In N. Colangelo & G. Davis (Eds.). Handbook of gifted education (2nd ed., pp. 282-291). Needham Heights, MA: Allyn and Bacon. Hennessey, B. A. (2003). The social psychology of creativity. Scandinavian Journal of Educational Psychology, 47, 253-271. Hennessey, B. A., & Amabile, T. M. (1988). The conditions of creativity. In R. J. Sternberg (Ed. ), The nature of creativity (pp. 11-38). New York, NY: Cambridge University Press. Houtz, J. (Ed.). (2003). The educational psychology of creativity. Cresskill, NJ: Hampton. Hunsaker, S. L., & Callahan, C. M. (1995). Creativity and giftedness: Published instrument uses and abuses. Gifted Child Quarterly, 39, 110-114. Lopez, E. C. (2003). Creativity issues concerning linguistically and culturally diverse children. In J. Houtz, (Ed. ), The educational psychology of creativity (pp. 107-127). Cresskill, NJ: Hampton. Lopez, E. C., Esquivel, G. B., & Houtz, J. C. (1993). The creative skills of culturally and linguistically diverse gifted students. Creativity Research Journal, 6, 401-412. Renzulli, J. S. (1973). Talent potential in minority groups students. Exceptional Children, 39, 437-444. Renzulli, J. S. (1986). 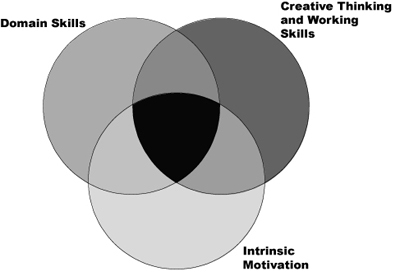 The three-ring conception of giftedness: A developmental model for creative productivity. In R. J. Sternberg & J. Davidson (Eds. ), Conceptions of giftedness (pp. 53-92). New York, NY: Cambridge University Press. Renzulli, J. S. (1998). The three-ring conception of giftedness. In S. M. Baum, S. M. Reis, & L. R. Maxfield (Eds. ), Nurturing the gifts and talents of primary grade students (pp. 1-27). Mansfield Center, CT: Creative Learning Press. Renzulli, J. S. (1999a). Reflections, perceptions, and future directions. Journal for the Education of the Gifted, 23, 125-146. Renzulli, J. S. (1999b). What is this thing called giftedness, and how do we develop it? A twenty-five year perspective. Journal for the Education of the Gifted, 23, 3-54. Renzulli, J. S. (2002). Expanding the conception of giftedness to include co-cognitive traits and to promote social capital. Phi Delta Kappan, 84, 33-40, 57-58. Renzulli, J. S., & Reis, S. M. (2002). What is schoolwide enrichment? : How gifted programs relate to total school improvement. Gifted Child Today, 25, 18-25, 64. Renzulli, J. S., Smith, L. H., & Reis, S. M. (1982). Curriculum compacting: An essential strategy for working with gifted students. Elementary School Journal, 82, 185-194. Ryan, R. M., & Grolnick, W. S. (1986). Origins and pawns in the classroom: Self-report and projective assessments of individual differences in children’s perceptions. Journal of Personality and Social Psychology, 50, 550-558. Stein, M. I. (1968). Creativity. In E. F. Borgatta & W. W. Lambert (Eds. ), Handbook of personality theory and research (pp. 900-942). Chicago, IL: Rand McNally. Sternberg, R. J. (1998). Principles of teaching for successful intelligence. Educational Psychologist, 33, 65-72. Sternberg, R. J. (2000). Identifying and developing creative giftedness. Roeper Review, 23, 60-64. Torrance, E. P. (1978). Dare we hope again? Gifted Child Quarterly, 22, 292-312. Torrance, E. P., & Sisk, D. A. (1997). Gifted and talented in the regular classroom. Buffalo, NY: Creative Education Foundation Press. Treffinger, D. J. (1986). Blending gifted education with the total school program. Buffalo, NY: DOK Publishers. Treffinger, D. J. (1988, April). Cultivating potentials: Beyond the gifted program. Teaching K-8, pp. 54-57. Treffinger, D. J., Isaksen, S. G., & Dorval, K. B. (1996). Climate for creativity and innovation: Educational implications. Sarasota, FL: Center for Creative Learning. Treffinger, D. J., Young, G. C., Nassab, C. A., & Wittig, C. V. (2003). Talent development: The levels of service approach. Waco, TX: Prufrock Press. Wallach, M. A. (1971). The creativity-intelligence distinction. New York, NY: General Learning Press. Webb, J. T., Meckstroth, E. A., & Tolan, S. S. (1989). Guiding the gifted child: A practical source for parents and teachers. Scottsdale, AZ: Great Potential Press. Winner, E. (1996a). Gifted children: Myths and realities. New York, NY: Basic Books. Winner, E. (1997). Exceptionally high intelligence and schooling. American Psychologist, 52, 1070-1081.